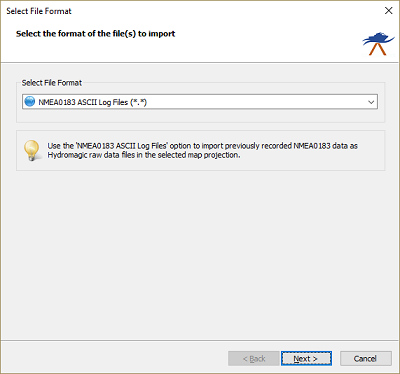 NMEA0183 log files are files where NMEA0183 data is recorded from devices like GPS and echosounder. 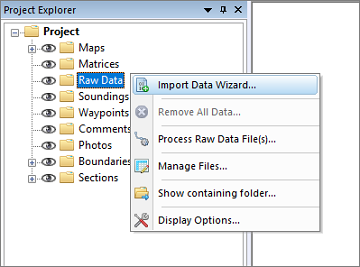 Instead of sending the data directly to Hydromagic in real time, the data was recorded on for instance a SD-Card. This method is often used on USV's (unmanned survey vessels) when it is not possible to establish a direct link to the shore. In these cases the data is stored on an onboard SD-Card or any other removable storage device. However, there is a big drawback when it comes to using NMEA0183 log files: Because depth records aren't timestamped in NMEA0183, it is impossible to get the actual time difference between the position and depth data which may cause the depth positions to be shifted. When the position update interval is low errors can be up to several meters which makes the data unusable. When the data is processed by Hydromagic, you won't have this problem because the incoming data timestamped as soon as the data comes in. 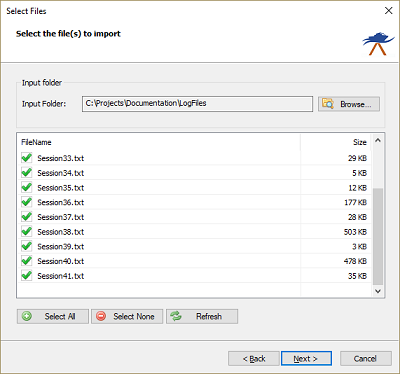 With some file formats, including NMEA0183, some additional options have to be set in order to import and interpret the data in the file correctly. 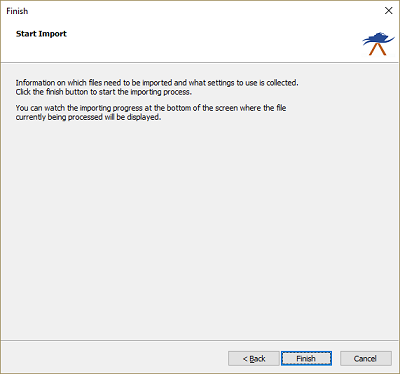 This is shown in the optional third step of the import wizard. When no options have to be set, this third page is skipped. 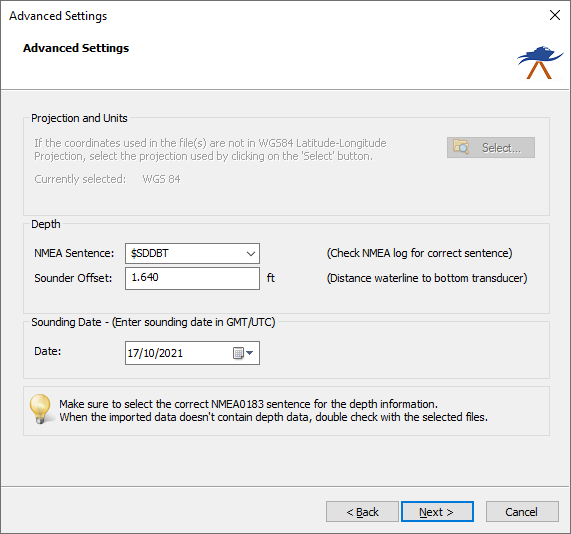 You can see the projection setting has been disabled, because position data in NMEA0183 is always in WGS84 geographic coordinates. 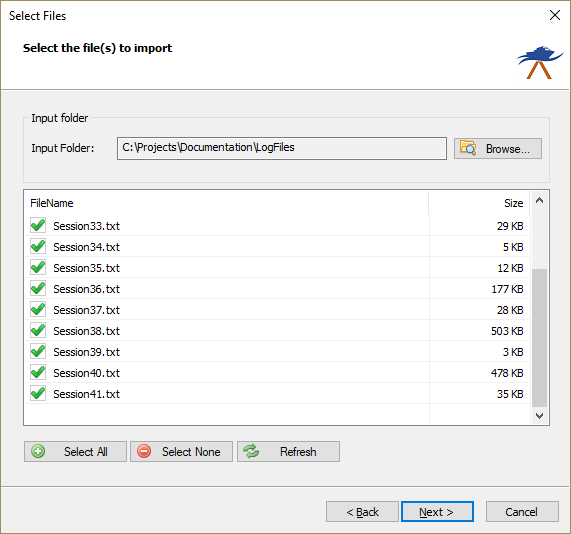 Also there is no need to set the units used in the file, because the units are mentioned in the NMEA0183 sentences and conversions are performed automatically. Use this settings to select the NMEA0183 sentence used to extract depth from the log file. Possible settings are: $SDDPT, $SDDBK, $SDDBS, $SDDBT and $SDXDR. Use this box to set the transducer offset to be used. This is the distance between the bottom of the transducer to the waterline. This settings is also called the static draft. If unknown, it is possible to leave this value zero and correct it later in the "Sounding Wizard". To add correct date and time information to your sounding, you can use the "Date" and "Time zone" settings. 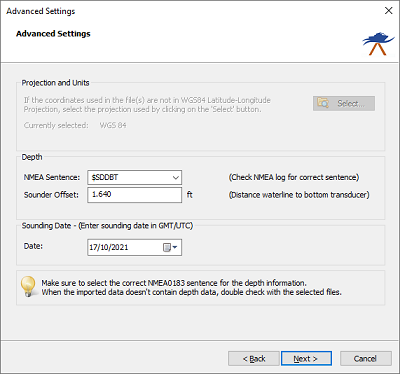 The time of the positions is stored in the NMEA0183 data as GMT time, so the correct time zone is required to convert the times to local time. This settings are optional, however, if the sounding is going to be used with tide files, you will need the correct timestamps on your data !